One of our all time Italian heirloom variety favourites. 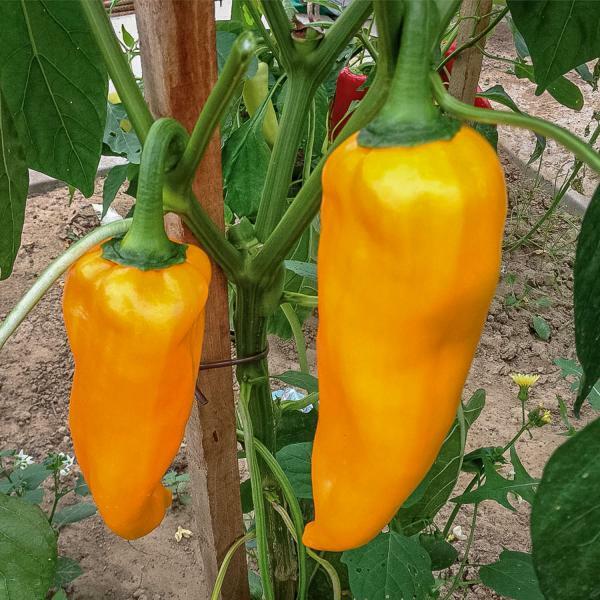 This early maturing variety variety produces lots of 8 to 10 inch long green sweet peppers maturing to golden yellow . 68 days. Corno di Toro (Bulls Horn Shape) Capsicum annuum. Plant produces high yields and they can be used at any stage of maturity. The thick flesh and gets sweeter as they ripen. This plant is loaded with peppers! One of the most popular sweet peppers on our farmers market stand. A wonderful addition to salads and very delicious in stir fries, great wow factor with striking appearance in the garden. Prolific and tall plants.